As said before everyone else is following the same strategy of offering business cards, brochures, rack cards and flyers, why don’t you stick to a business calendar magnet. Perfect for building impact 365 days a year and a recipient will retain it as a refrigerator art, after the year-ends. Calendar magnets work great for businesses and marketers of all budget sizes because they are highly purposeful and everyone loves them. In US, the beginning of a New Year means start of another frenzy sports season. People are eager to chew volume of sports information that comes their way and would be happier to retain such informative personalized sports schedule magnets over their refrigerator door. By doing so, you are not only trying to sound like sports enthusiast, but also a human-friendly marketer, who values sentiments over everything. You can target sports fans in your area by gifting away customized sports schedule magnets 5.5 x7 to them. People would love to have them before their eyes always. Everyone loves to pampered and your clients/customers are going to be no different. You can acknowledge their existence by gifting customized 7 x 5.5 magnets during the tradeshow. Or you can take down details of interested prospects and mail them a holiday wishes magnet in time. Whatever be the reason of gifting, recipients would love to retain such happy and gay personalized magnets over their refrigerator doors as much as they want. Perhaps this type of promotional gifting works best during Christmas, New Year or during July 4! In addition, you can try vivid personalization strategies over these customized magnets to cater particular targeted segment. Everyone loves to receive small gifts during tradeshows. You can try to be little different from your competitors by handing customers a small bag of goodies featuring a complementary full color personalized magnet 5.5 x7. People would love them and would retain colorful personalized magnets over refrigerator door or other visible surfaces or you can urge them to carry it over their cars. Actually, you can have superior personalized experiences by working over 5.5 x7 magnets. 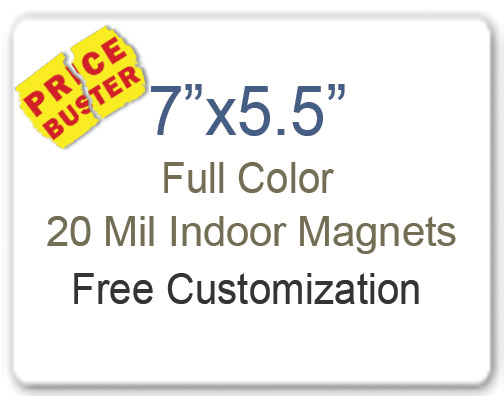 You can avail discounts and many other value benefits such as free art setup, free online design proof and free shipping on sourcing these advertising magnets from any reputed online store stocking made in USA magnets.